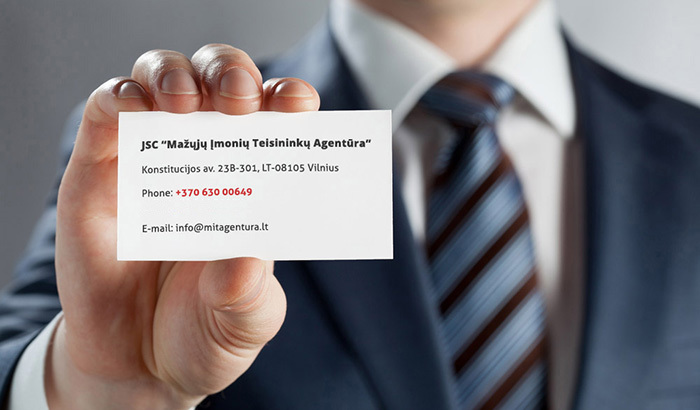 JSC “Mažųjų įmonių teisininkų agentūra” is the only company which provides legal services in Lithuania. Its activity‘s main principle is offering lawyers for rent for middle and small companies. This is a brand new service which is useful for employers, who seek efficiently reduce company’s costs. It is the unique ternary form of employment, when in labour relations participate temporary employing company, which pays salary for person, whom temporary transfers i.e. “rents out” for the another company, which needs the lawyer at that moment. Our offered services will help small and middle companies to reduce administrative load, related to personnel management, recruitment/dismissal procedures, wage and accounting for taxes, cost of maintaining of a workplace, as our company’s lawyers will provide You legal services from our office at a distance, and when needed lawyers will appear to Your company, court or any other institution to represent Your interests. 2019 © JSC “Mažųjų Įmonių Teisininkų Agentūra”. All rights reserved.